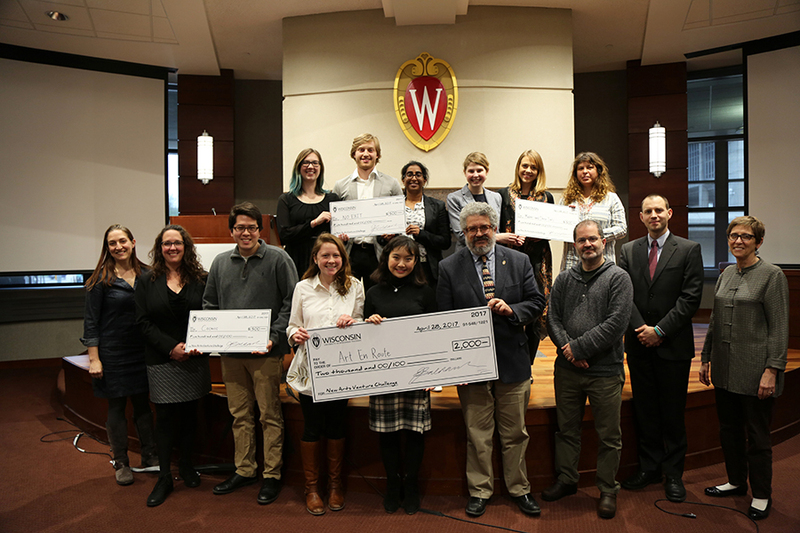 The University of Wisconsin–Madison Arts Business Competition is a campus-wide competition to encourage new thinking and innovative ideas, and to provide support for student-driven projects. Entrants will develop and submit a thorough proposal for an arts event, exhibition, series, commercial venture, or other artistic project. Proposals should demonstrate creativity, innovation, added value to the arts, and potential for success. In addition to exhibitions and performances, past winning projects include a public art collaboration, an educational workshop, an online community, a clothing line, and a 3-D printed saxophone mouthpiece. Entries may be from individuals or from teams of up to three. The lead team member must be a full-time UW–Madison student. Three student proposals will be invited to participate in the final round, where each proposal will be evaluated on both the written plan and an oral presentation. The top three proposals receive funding of $2,000, $1,000, and $500 in support of their projects. *Prize money may be taxable. Entrants should consult a tax advisor. Proposals due: Friday, March 8, 2019 by 11:59 pm. All proposals must be submitted electronically. 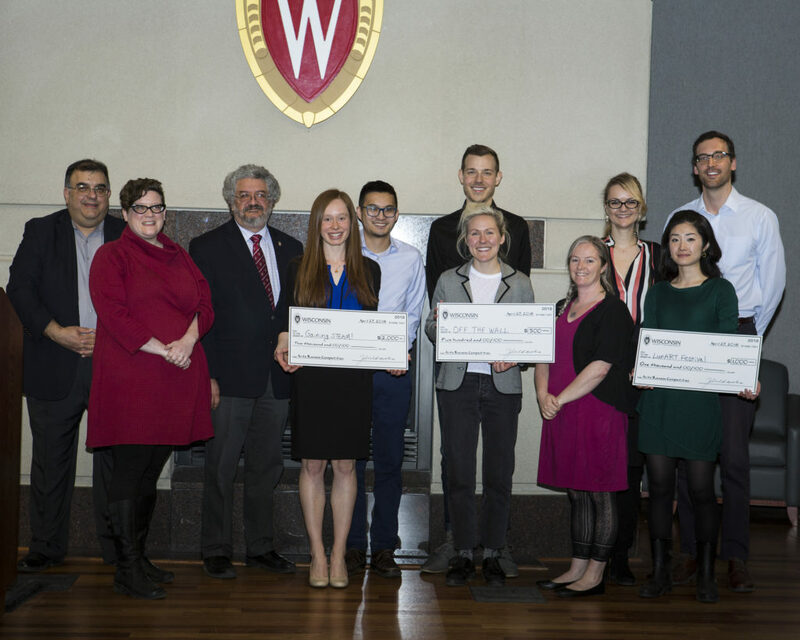 Finals: Friday, April 26 2019 from 4:00 – 6:00 pm in the Wisconsin Idea Room, School of Education Building. Free and open to the public. The Cover Page should include the name of your project, the names of your team members, the date, the name of the competition, and an image or graphic element related to your project. The Table of Contents should list section titles along with their corresponding page numbers. This is an overview of your project in 300 words or less. The Executive Summary is a place to answer three questions: Who are you (or your organization)? What do you do (or want to do)? Why does it matter (community impact)? Use this section to provide details on the project, such as what you’d like to do and the steps that you’ll need to complete to make it happen. What is the actual production plan? What facilities or city agencies might be involved? Who do you need to partner with to make your project happen? What kind of equipment do you need and how will you get it? What are your current resources and opportunities? How will you integrate these elements into your project? Have you started your project already? Depending on the length of your project, provide a monthly plan from the start of the project to the completion of the project. Who is going to your event and why will they come? Why do you think that there is a need for it (even if you are inventing the need)? How do you plan to reach your audience and what innovative, effective, and cheap or free tools can you use to reach your audience? Will you take out any ad space? Will you print flyers or anything else? Is postage involved? Bulk mail? Email newsletters, social media, etc.? Provide names and bios (75-100 words) for the up to three key people on your team. You may also include resumes in the Work Sample. 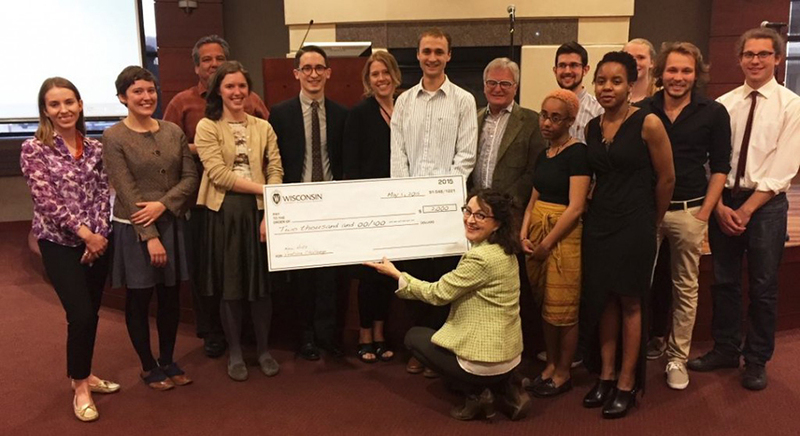 Only the lead person on the project has to be a full-time UW–Madison student. Assisting artists and bios of those assisting artists (like orchestra or cast members) or personnel do not have to be named but you may choose to provide a brief description of the other positions/people that will be integral to your success. Create a table/spreadsheet with your expenses and your expected revenues with at least three columns (name of the item, how much, and notes if needed). What are the expenses related to this project? Are you paying people? How much and for what work/positions? Are you renting space? Where and how much does it cost? Do you need any equipment or materials? What are the potential revenues for your project? Are you selling tickets/registrations/admissions and, if so, at what price and what is your expected audience? Are you applying for grants and if so, which ones do you have in mind? Will you be receiving any in-kind donations of goods or services that you won’t have to pay for? If so, what items, where are you getting them, and what is their value? Are there any other sources of revenue? What are your challenges now and what do you foresee your challenges will be over the course of the project? This is your chance to share examples of your work. You can include high resolution images and photos; links where judges can access sound, video, photo files, or portfolio materials; or a DVD or CD. Please also include a picture of your team (for media purposes). Proposals (excluding the Cover Page, Table of Contents, and attachments) should not exceed 6 pages, with a minimum point size of 10. Make sure to include section titles and page numbers on all pages of your proposal. All applications for 2019 will be submitted online only. Note: Participants’ contact information has been removed from their proposals. The contest is open to all students who are enrolled full-time in a UW–Madison degree program and are in good academic standing. Entries can be submitted by individuals or teams of up to three members (supporting team members are not required to be full-time UW–Madison students). Proposals must be of original work. Proposals will be returned to all entrants with comments and suggestions from the judges. The winning proposal’s event/exhibition/project must be presented to the community no later than May 2020. Please note: There are two dates that finalists must be available for: Final Presentation (TBA) and the Awards in the Creative Arts (May 7, 2019). Three independent judges will review the proposals and choose three finalists. They will attend the competition finals and choose the first, second, and third place winning proposals. Judges will be selected from prominent members of the professional arts and business community. 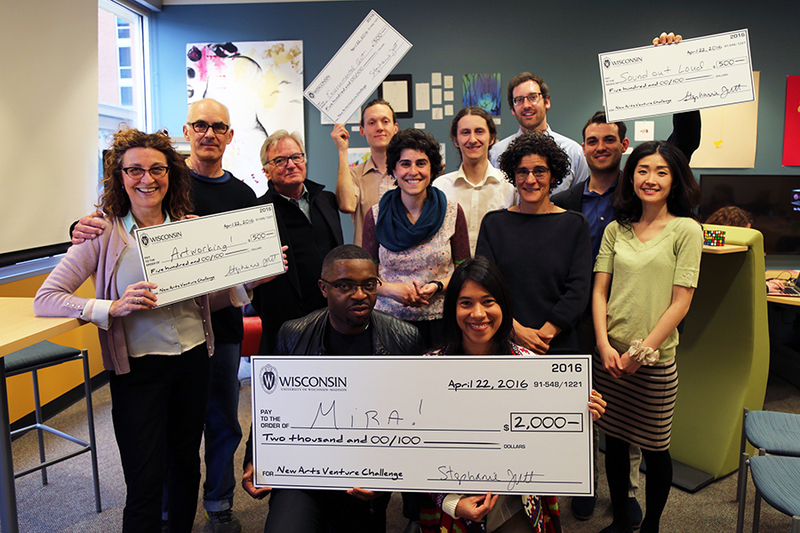 The UW–Madison Arts Business Competition reserves the right not to select a winner. Submissions for the 2019 Arts Business Competition are now closed. "This program was very instrumental to the formation of CrowdArt, and we were able to incorporate and grow directly out of participation in that competition. We learned a great deal from refining our pitch to the judges, as well as met some great people working in the Madison community." Below is a list of finalists from previous years, dating back to 2009. Many projects have been successful! Some finalists’ successful applications are available for use as reference for future applicants. A project teaching scientists how to convey their research through stories, including through comics. Additional participants will include graduate students and community artists. LunART Festival’s mission is to support, inspire, promote, and celebrate women in the arts through public performances, exhibitions, workshops, and interdisciplinary collaboration as they navigate gender imbalance in artistic fields. There will be over 30 individuals involved in planning and performing in the festival held in Madison in late June 2018. OFF THE WALL is a nighttime, outdoor screening series of contemporary video art from a wide range of artists at various points in their careers, shown in Madison in August 2018. View more photos on SmugMug by clicking here. Connecting literary works with visual art on public transportation. Creative writers and visual artists will collaborate to create unique commissioned works of art which will be photographed and then printed on exterior wraps on Madison Metro Transit buses. Original works will also be shown in an exhibition. Clothing line that connects scientific research, flowers, space flight and art. The socially responsible fashion line will also come with a note that explains certain aspects of spaceflight and astrobotany. Traveling exhibition featuring an indigenous group in Nepal with their stories and cultural crafts presented through an artistic lens. Artisan products will also be available for sale during the exhibition. Avant-garde audience-centered theatrical experience based on the play No Exit by Jean-Paul Sartre. Audience members will find themselves going through an immersive ‘hell’ via various mental and physical experiences. UPDATE: Click here to check out “Hero of my Own Tale,” the finished product from the Bellhops that was funded by the New Arts Venture Challenge grant. Congratulations! Building a network for Wisconsin artists and appreciators of the arts by offering coverage for arts initiatives, facilitating dialogue on the role of the arts and offering an engaging experience for its users. An exhibit that facilitates interactive learning and discovery of the inner workings of the mind. Evolved into Artists in Absentia. Showcasing the creative work produced by the men who participate in Oakhill Prison Humanities Project through a public reading, a multimedia exhibition and a small publication. UPDATE: Artists in Absentia exhibit was held at local public libraries beginning March 3, 2016. Visit the website for more information. The exhibition was featured on the front page of the February 18 issue of Isthmus. Click here to read the story! Building canoes with Native American master craftsman, Wayne Valliere, to preserve the tradition of birch bark canoe making and to connect American Indian students to their culture and language. Percussion ensemble that breaks down the boundaries of the traditional concert program. In partnership with five Madison-area high schools and the UW–Madison School of Music, VIBES facilitated several events to promote small ensemble music. Through VIBES, UW student chamber musicians mentored and coached emerging high school chamber ensembles in order to revitalize chamber music for younger audiences.